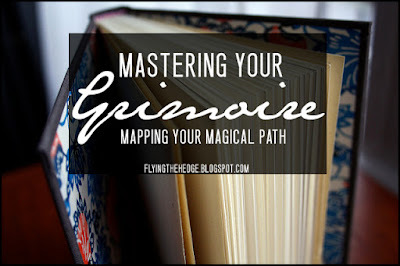 Before you can even begin your grimoire, it is important for you to map your magical or spiritual path. If you have been practicing witchcraft for quite some time, mapping your magical path may seem like a waste of time, but I implore you to do this exercise all the same. You may be surprised at what you discover about yourself. Having a clear idea of your magical path will aid you in the creation of your grimoire. It will help you pick what type of format to use, how to decorate it, how to organize it, and what contents are important for you to include. For example, a hedgewitch like myself will want to make sure to include a section on hedge riding, proper etiquette while riding, and any spiritual guides you may have. Kitchen witches will want a place for recipes, Wiccans a section for rituals and high magic, and green witches a large section for herbs, trees, and other plant uses (mine is going to have this too!). Below is a series of questions you need to explore over the next week. Spend time thinking and meditating over these questions. Be honest with yourself. If you are not honest and upfront, you will end up mapping a path that will not suit you and your spiritual needs. In the end, you'll end up putting your grimoire aside without completing it; it won't be something you are proud of. I have listed the questions in this post, but have also creating a Mapping Your Magical Path worksheet you can print. How do you define yourself? What adjectives best describe you? Are you spontaneous or do you prefer to plan ahead? What are you beliefs regarding witchcraft? Do you define religion and spirituality differently? Explain? What drew you to witchcraft? What do/did you hope to gain through the use of magic? Are you drawn to any particular cultural heritage or type of witchcraft? Do you prefer a mix? Do you prefer to practice alone or with others? Why? Is there any type of magic that comes naturally to you? If so, what? Do you believe in any deities? Id so, do you subscribe to a certain pantheon? Are you drawn to any particular practice, such as divination (tarot, runes, tea reading, etc), herbalism, or ritual work? If so, what? Do you feel a strong association to any plants, crystals, seasons, moon phases, stars, animals, planets, etc? If so, what? Did any of your answers surprise you? If so, which ones? Why? If you wish to complete the worksheet, you can find it here. Remember, spend the next week answering these questions. Your answers will greatly assist you when you begin planning and organizing your grimoire in the upcoming weeks. I cannot stress it enough that you need to be honest and forthright with you answers. We are creating a book infused with our magic and our souls. The only way to accomplish this is to have a clear, honest path to follow. Good post, thank you. :) I'm going to think about these questions. Thank you! I hope you find the questions worth while. I've been slowly updating mine. Are you going to do a ritual from yours for tomorrow's full moon in leo? This looks hugely helpful! Thanks! This is awesome! I just answered these questions under the blood moon. I'm only just delving into the whole witchcraft world and it's definitely opening my eyes. Unfortunately it's not really a popular thing where I live (Hong Kong), but looking forward to learning more and connecting with other people interested! Welcome to the Craft! I'm glad these questions helped you figure out where you want to go. I wish you the best of luck on your journey. I can understand living in an area where witchcraft is not very popular. While I live in the States where there is a growing number of witches and pagans, I live in the Southern US where Christianity is extremely dominant and it can be unsafe to travel certain places if you are openingly practicing the Craft. I hope you fair better in Hong Kong! Thankyou for this series. I feel like I've been a dog chasing its tail for about 3 months now not know where to even start on this path. This blog just makes so much more sense to me. I am glad you enjoyed the series and my blog. Thank you for reading and commenting!